The importance of randomized controlled trials within medical research has been expressed by Korn and Baumrind: (51) 'Randomized clinical trials are the sine qua non for evaluating treatment in man'. Pocock(53) has further clarified the role of randomized controlled trials by saying they can be applied to 'any form of planned experiment which involves patients and which is designed to elucidate the most appropriate treatment of future patients with a given medical condition'. 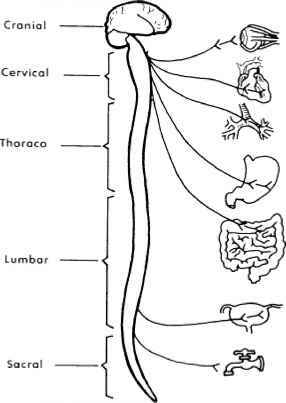 The advantages of the research design of these studies have been extensively described (54) and are shown in T.able.7. However, the design limitations of such trials also need to be appreciated, particularly in relation to health service research. 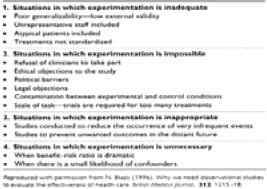 (5 56) The main limitations and disadvantages of randomized controlled trial design are shown in Table 8. In addition to the technical limitations of the trial design, there are also situations where randomized controlled trials are not applicable to specific research questions. 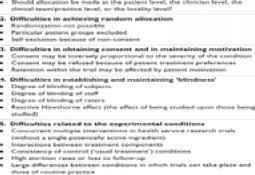 These can be summarized as conditions in which randomized controlled trials are inadequate, impossible, inappropriate, or unnecessary, as shown in T§b!e.9..
An example of a randomized controlled trial for evaluating differences in outcomes for patients with schizophrenia is the study by MacFarlane et al.,(57) which compared assertive community treatment with either intensive multiple-family psychosocial education or with episodic psychoeducation as a part of crisis interventions. The results showed that for both groups (n = 37 and n = 31 respectively) hospital readmission rates and symptom levels were significantly reduced, and there was increased participation in treatment. Patients in the experimental group had higher sheltered employment rates during most of the study. Few other differences in the major outcome variables were found. The results suggest that both intensive and episodic family involvement are not significantly different for most outcome variables. In terms of assessing the quality of a randomized controlled trial, Marriott and Palmer(58) have suggested using a framework of 14 questions. We shall illustrate the use of this grid of questions by critically applying it to the study of family-aided assertive community treatment mentioned above (57) (Table . . . 10).